895 Maple Ave Burlington - Bradbury Estate Realty Inc. This complex of approximately 200 3-story townhomes is ideally situated across from Mapleview mall and walking distance to the lake, Go Station, Longos, and downtown Burlington. Most units have 2 bedrooms, but there are a few bachelor and 3 bedroom units. The Brownstones attract young professional couples, investors, empty-nesters and also young families due to the close proximity of excellent schools and parks. Condo fees vary but are approx. $240-$300/ month. 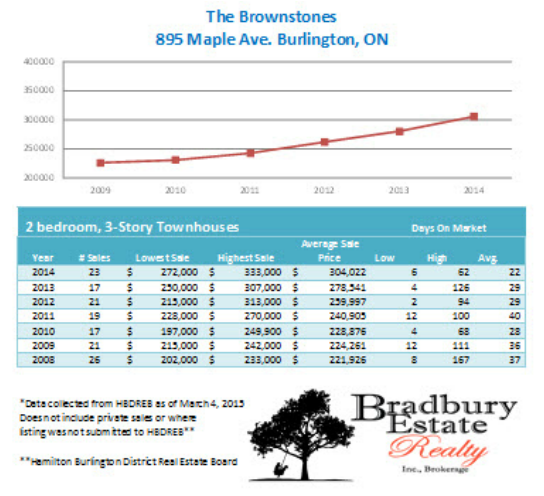 Subscribe to The Brownstones - 895 Fairview St.
semi-annual updates via email. You will also be automatically notified about new listings and sales in your complex. We promise, we won't bug you…we just want to keep you informed.